Eira is leading Spinverse's ICT and security team and heads the services for the customers in those areas in open innovation, EU H2020 projects and proposals, and commercialisation activities. Eira has experience both from industry and academia, in research and project management. Eira's expertise areas include high performance computing, nanotechnology, materials science, acoustics, radio implementation, etc. Eira has also acted as an expert evaluating proposals on behalf of European Commission for multiple EU H2020 calls. 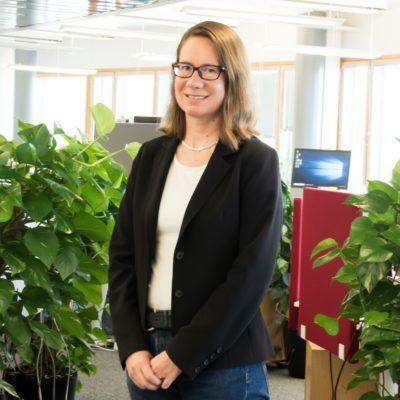 Eira joined Spinverse in 2013 and has been helping companies in Horizon 2020 projects and worked with commercialisation of research results from research institutes. In addition, she has managed content of international conferences, such as EuroNanoForum 2015 and Industrial Technologies 2014. Before Spinverse, during 2004-2012, she worked at Nokia Research Center, latest as a Principal Researcher. There she gained broad knowledge on nanotechnology, computational acoustics, and radio implementation. She also managed several large-scale projects and applied successfully funding for them. Eira received her doctoral degree in Computational Physics from Helsinki University of Technology (now Aalto University) in 2001. Her doctoral dissertation, belonging to the area of statistical physics, was accepted with distinction and was awarded by the Department of Engineering Physics. During 2001-2004 Eira was as a post-doctoral researcher at Lawrence Livermore National Laboratory in California, studying plasticity and fracture in metals by creating a massively parallel molecular dynamics code. There also, she applied and was granted funding for a project as a Principal Investigator. Eira has over forty publications in various fields (h-index=13), as well as sixteen granted patents (in nine families) in the nanotechnology area. In her spare time, Eira spends time with her two children and husband, especially in their summer cottage in Helsinki archipelago. She also enjoys traveling, sailing, and various outdoor activities, such as downhill skiing, swimming and cycling, among others.